Cervantes said “Hunger is the best sauce in the world.” That’s only because he never tasted my ragù. This weekend, my family and I rendezvoused with Glossy and her mother, the Baroness Butterscotch von Leibniz. 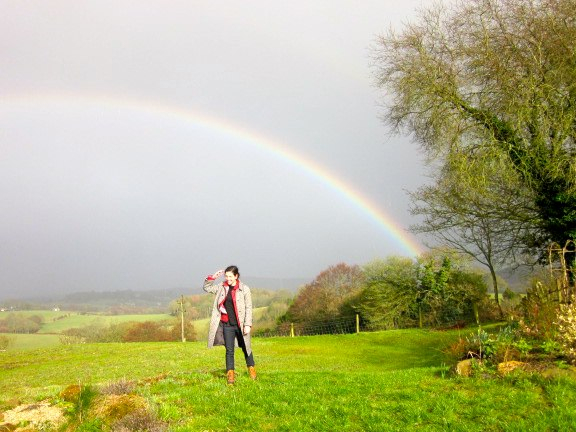 Our destination was the Baroness’ French cottage which is so deep into the English woods that this is its exact address: Near-a-pot-of-gold-at-the-end-of-the-rainbow, Great Britain. When we all arrived, we were famished. I mean have you ever traveled to the end of a rainbow? It can take all day. Ask Dorothy or any leprechaun. That’s why after some champagne and potato chips, I left everyone hearthside to investigate the contents of the kitchen. Let me share with you the goodness I found and the recipe for the ragù I created. It’s porcine decadence and will make you feel like the most spoiled spaniel sleeping in front of the fire. First, brown the sausages and set them aside. Next, caramelize the onions with some olive oil on medium-low heat for about five minutes. Sir them with a wooden spoon to prevent sticking. When the onions have gone all soft and sweet and caramelly, add the smashed garlic cloves and stir for a minute more. Boil a large pot of water to make your pasta. Tend to it as the manufacturer recommends. Now, chop the sausages. Add them to a saucepan with the onions and garlic. Sauté for a minute or two with most of the thyme. Make sure the sausage is cooked and no pink bits remain, but don’t let anything get crispy–use low heat. Now add a 1/4 cup of sherry to the mix and continue stirring. Cook down until it looks like a glaze. Alternate a bit of chicken stock with 1/4 cup sherry until you’ve used up all the liquid called for in this recipe. What you want is for the liquid to be more of a glaze than a soup. When it’s done, take it off the heat and add the remaining thyme as well as the salt and pepper. In a large bowl, mix this ragù over your favorite pasta and sprinkle liberally with cheese. This entry was posted in Recipes and tagged Abruzzo, best sauce in the world, Cervantes, champagne, decadence, Dorothy, end of the rainbow, fire, Garlic, hunger, leprechaun, linguine, linguini, Manzanilla, no tomatoes, Pasta, porcine, pork, pot of gold, potato chips, ragù, rainbow, Rustichella d'Abruzzo, rustico, sauce, sausage, sherry, smashed garlic, spaniel, thyme by chagrinnamontoast. Bookmark the permalink.